Major League Baseball’s oldest franchise is also one of its most successful. The Cincinnati Reds has won five World Series titles, ten Division titles, one AA Pennant, and nine NL Pennants. The Reds however, did not qualify for the playoffs last year for the 4th year in a row. The five-time World Series champions Cincinnati Reds are looking to drastically improve their record this year. They will have to overtake rivals the St. Louis Cardinals and the Pittsburgh Pirates in a heated NL Central race as well as gain separation from their state rival the Cleveland Indians to become Ohio's team. Grab your 2018 Cinicinatti Reds tickets and head down to the Great American Ball Park to be apart of the home field advantage. Placed in MLBs toughest Division - National League (NL) Central Division - and having won five World Series titles, the Cincinnati Reds is bound to make some of the greatest plays. Ken Griffey Jr. joins the 600-Home Run Club – On June 9, 2008, Ken Griffey Jr., at Dolphin Stadium deposited a Mark Hendrickson curve ball deep over the right-field wall, marking his six hundredth career home run. With this, Griffey became only the sixth player in MLB history to join the exclusive club. Barry Larkin joins the 30-30 Club – On September 22, 1996, another Red made MLB history. Barry Larkin became the first shortstop to join the prestigious 30-30 club (30 homers and 30 stolen bases in one season). He achieved the feat against the St. Louis Cardinals in the first game of a doubleheader at Cinergy Field. Reds were the Best in 1975 – In 1975, the Reds had one of the best teams in baseball history. Ken Griffey, George Foster and Dave Concepcion were popularly called the Big Red Machine that finished its regular season 108-54. The Reds were ranked No.1 in the NL in runs and at No.3 in ERA. Once in the playoffs, the Reds swept the Pirates in three games in the NLCS. In the World Series, they faced the formidable Red Sox. Though it took the Reds all seven games to defeat the Red Sox, they eventually succeeded, winning their third World Series. The Cincinnati Reds’ rivalries can be described both as interleague and historical. For example, the Reds vs. Indians rivalry is essentially a contest between National League and the American League. The Reds vs. Dodgers rivalry has historical significance. Battle of Ohio – This battle is fought between the Reds and the Cleveland Indians. Both Cincinnati and Cleveland are major cities in Ohio and situated on I-71. Their rivalry record runs neck-to-neck and therefore it is hard to predict their games in advance. Reds vs. Dodgers – In its heydays (70s & 80s), this rivalry produced some intense moments in the MLB. The reason was that both teams more often than not were competing for the NL West Division title. This rivalry however ended when the Reds were moved to the NL Central Division. Nonetheless, the two met again in the 1995 NLDS, a contest that the Reds won 3-0. No team wins the World Series without having exceptional players on the roster. Pete Rose – Rose was a hometown hero. Born in Cincinnati, Rose had one of the all-time great careers of any player in the history of baseball. A 17-time All-Star, Rose was named to baseball’s All-Century team in 1999. You don't compare anyone to Johnny Bench. You don't want to embarrass anybody. Frank Robinson – Robinson was one of the greatest players of all time and not just in Cincinnati. In his 10 seasons with the Reds, Robinson won a Rookie of the Year award in 1956, MVP in 1961, as well as making eight All-Star teams. The Cincinnati Reds hasn’t won many playoff games. Yet, the Reds have been able to win five World Series, which ties it with the Pittsburgh Pirates for seventh most World Series wins. The Reds may just repeat history again by pulling off an unexpected big one in the upcoming MLB season. And when it happens, you need to be at the Great American Ball Park, home of the Reds. So, buy Reds tickets today. This 42,000 seat stadium is located in the heart of downtown Cincinnati. The Great American Ball Park provides breathtaking views of downtown Cincinnati, Mt. Adams, the Ohio River and Northern Kentucky. Fans can also learn about the history of the Reds with mosaics of Reds Hall of Famers, three-piece mural exhibit, and even a rose garden. Fans of all ages can enjoy the Great American Ball Park by purchasing their Reds tickets here. Our process for purchasing cheap Cincinnati Reds tickets is simple and fast. There are so many online ticketing sites, that it can be hard for customers to find the right place to buy Cincinnati Reds tickets at the cheapest price. At ScoreBig we think of our customers first and foremost. We offer daily deals for Cincinnati Reds events, so our customers can get the best seats for the best prices. ScoreBig will always go above and beyond to offer the cheapest Cincinnati Reds tickets on the market. The Cincinnati Reds schedule above, displays all available events for 2019 and 2020. Once you find the event that you would like to go to, click the red “Get Tickets” button. It is located on the right-hand side of the event listing, it will take you to an Cincinnati Reds event ticket page. ScoreBig's event ticket page will display all available Cincinnati Reds tickets for that event. On the event ticket page to help with your search for the right Cincinnati Reds tickets, use the filters at the top to select quantity, price range, and more. There is also an interactive seating chart so you can pick where you want to sit. When you are ready to buy a ticket, click on the listing, and you will be directed to ScoreBig's checkout page. Upon completion of the information fields, your order will be processed and your Cincinnati Reds tickets will be delivered via email, mail, or to your mobile device. What makes ScoreBig’s site stand out from the rest? We are constantly analyzing our competitors to improve our site, service, and prices. ScoreBig.com employees strive to offer the best process and experience to buy cheap Cincinnati Reds tickets. Our goal is to get you the best seats to Cincinnati Reds events. We offer daily discounts on our site and for special promotions check out our newsletter. If there are no Cincinnati Reds events currently available, you can use our search feature at the top of the page to see a list of all popular events going on near you. No matter your price point, we have all the best deals and discounts on Cincinnati Reds tickets. For more information on prices of Cincinnati Reds tickets and the schedule for Cincinnati Reds, check out our listings above. The last thing you want to find out is when the Cincinnati Reds event you wanted to go to is sold-out. Don’t worry in many cases ScoreBig has affordable tickets to sold out events. We sell tickets from GA all the way to premium seating and parking. Skip the scalpers in the parking lot and get your tickets online from top Cincinnati Reds ticket brokers. We get you in all events, buy your Cincinnati Reds tickets here from a brand that many trust and rely on for all their ticketing needs. ScoreBig offers a 100% money-back guarantee. If you have been in search of cheap tickets for Cincinnati Reds, ScoreBig by far is the best option. That’s why ScoreBig has more loyal customers than any other ticketing site. 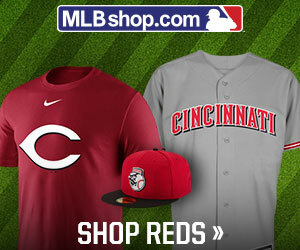 Shop at ScoreBig for safe and secure Cincinnati Reds event tickets.